By the waves of Kamo River. A wonderful example of Rengetsu’s calligraphy, this scroll is item #62 on page 51 in the catalog, Black Robe, White Mist: Art of the Japanese Buddhist Nun Rengetsu . 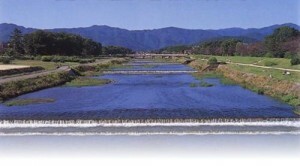 Kamo River is known for its pure water that could be used for drinking until modern times. 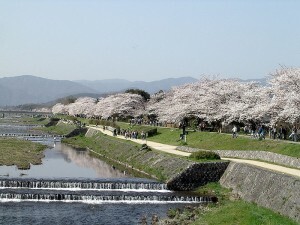 Water from the river was employed extensively in the tea ceremony, tofu production, soba broth, Kyoyuzen dyeing, and the like. People perform purification rites in the running water in order, as it says in Rengetsu’s poem, to wash away the dirt and grime of their bodies and minds. 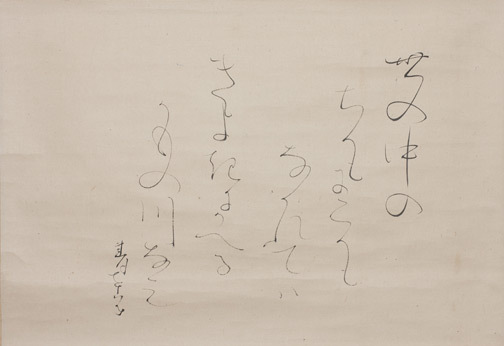 The artist Honami Koetsu was summoned by the Shogun to his castle in Edo (Tokyo) and requested to do some calligraphy. After Koetsu mixed the ink and water on the ink stone, Koetsu did a few test strokes. He put down the brush, and told the Shogun, “Edo water is not good enough.” The next time Koetsu came to Edo, the Shogun made sure that water from Kyoto had been prepared. Most of the year, the Kano River runs shallow, no more than a meter or so at its deepest, but during rainy season it can flood severely. In 1936, Kamo River overflowed its banks, sweeping away most of its bridges, inundating 24,000 homes, and drowning twelve people. After that, thorough water-control was implemented and today the river is not much more than a trickle—in fact, there are stepping stones that make it easy to cross the shallow water. 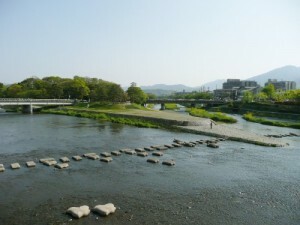 In addition to Rengetsu’s waka, many poems have been written about the Kamo River. One Response to "Kamo River Calligraphy"
I’m grateful for your blog.